Amid widespread fears about cable cord-cutting, ad market sluggishness and the future of film distribution, Comcast's third quarter earnings might provide some reassurance. Revenue at the cable company were up 11% year over year, beating Wall Street's forecasts. More homes continue to sign up for broadband while fewer homes opt to cancel their TV subscriptions. And a big hit still conquers all -- revenue at NBCUniversal soared thanks to blockbuster movies like "Jurassic World." Brian Roberts, the usually modest CEO of Comcast, called the results "outstanding." Of course, Roberts is trying to restore confidence in his business and in the media industry writ large. A selloff of major media stocks in August was triggered by renewed concerns about the pace of cord-cutting, which affects both the cable distribution side of Comcast and the many TV channels it operates. Wall Street analysts expect several hundred thousand homes, perhaps 300,000 overall, to cancel their cable subscriptions in the third quarter. In some ways Comcast has been leading an industrywide charge to keep those cords connected. The company has been losing TV subscribers for years, partly because of competition from DirecTV and Verizon FiOS, but also because of dissatisfaction with the ballooning cost of the monthly bundle. Streaming services like Netflix (NFLX), seen as complements to the bundle in many homes, have replaced traditional cable packages in others. 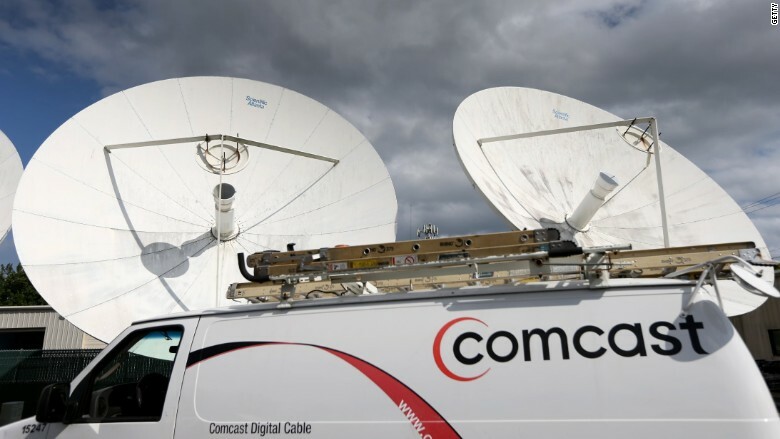 Comcast (CCV) has been improving its set top box, channel guide and customer service in a bid to retain subscribers and win back some of those who've left. It has also introduced new, cheaper TV options. "We had 40% improvement -- I like the trajectory of video," Roberts said in a Tuesday morning interview on CNBC before pivoting to the part of the business that's growing: broadband. The company gained 320,000 broadband customers, its best third quarter result in six years. Roberts noted that "we have a higher margin on broadband." Overall Comcast's "total revenue per customer relationship," a measure of how much the average household is paying, is up 4.3% year over year. Telsey Advisory Group analyst Tom Eagan called the company's overall results "very solid" with "strong financial and customer growth." At NBCUniversal, the cable channels business had a shaky quarter, with slipping ratings and relatively weak ad performance. Ad revenues were up only 2% over last year. Higher sports programming costs hurt operating cash flow. But NBCUniversal's movie studio had an extraordinary quarter, with huge box office revenues from "Minions," "Jurassic World," and the continuing success of "Furious 7," a movie that actually came out in the second quarter. Revenue from filmed entertainment was up 64% year over year.